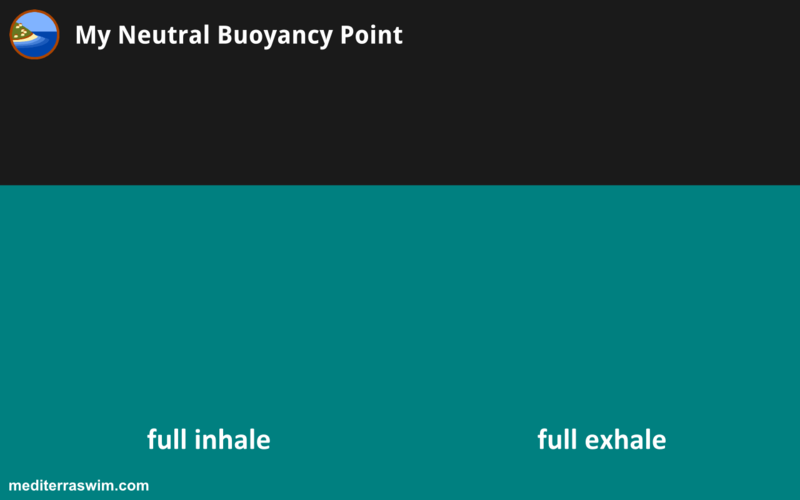 What Is Your Neutral Buoyancy Point? | Mediterra - Swim & Run Better Than Ever! 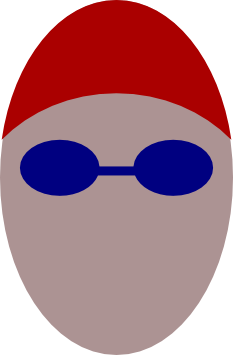 Since then those posts have received a good deal of attention and I’ve enjoyed hearing from various swimmers about their ideas and progress with overcoming the sinking problem. It also inspired me to get a better picture of how much variance there is in buoyancy among us humans-in-water. The first step was to measure my own. When I did this test in the sea, my normal training spot, my body with full inhale settled with the water line splitting my goggles. When I gently released all my air I started sinking as if I would never stop. The bottom was maybe 4 or 5m below so I didn’t bother to see how far. When I did this test in a chlorinated pool my body with full inhale settled with the water line above the line of my swim cap on my forehead. When I gently released all my air I sank to the bottom (2m) immediately. Now, with a little body mass/volume calculations I could estimate what % of my body I am allowed out of the water in my neutral position. Previously, we’ve referred to the roughly 95/5% iceberg principle- a human is permitted only about 5% of his mass above the surface of the water and if more than that he will be required to divert some portion of his energy to fighting gravity. By calculating my personal % I could find out if I come in above or below that approximate average %. The third test I need to do is with my 0.5mm Sailfish Edge sleeveless speed suit on (which I might use occasionally in cold water/air conditions). That will affect my buoyancy further, but how much? It is certainly less buoyant than the typical 3/5mm wetsuits most people wear, but it is still adding something. I am curious. Without the aid of a nice physio-lab to measure things in, we might use this simple test anywhere we swim to get a reading on buoyancy and be able to compare it to one another. This in turn could help us pick which advice might work better for each kind of buoyancy situation. And, as my diagram above reveals, different water composition will affect a swimmer’s buoyancy point. We are familiar with how much more buoyant we are in salt-water, and the sea is the Eastern Mediterranean is particularly salty, as salinity in seas and oceans go. But also natural fresh water, mineral-laden water, chlorine, bromine, saline pools may affect buoyancy to some noticeable degree also – it would be a interesting experiment to find out how much. Now, I would like to invite you to conduct the experiment on yourself and send me your results! 1) Find some water deep enough that you cannot touch the bottom with your feet. The water needs to be calm, free of turbulence and current. If the bottom is close to your feet, you may bring your legs into a cross-legged position to bring them up, closer to your body, and you can hold them with your hands. But keep your torso and spine vertical. 2) Allow your body to gently settle so that you are using minimal amount of hand movement to keep your nose above the surface. 3) Lift your mouth and take a full inhale of breath and hold it. 4) Make sure your head and spine are fully aligned. You should be looking directly horizontal, keeping your neck ‘long’ so that the crown of your head and spine are pointing up directly up against gravity, as if you were standing on land. 5) As gently as possible allow your body to sink down to it’s neutral point – if there is one. You want to ‘sit down’ onto the water until it holds you up. You want to create no momentum by moving your body parts, and create no turbulence in the water that will interrupt the balance of the natural forces acting on your body. If you have been pushing up against gravity to breathe, when you let go gravity will push you down and the momentum of your body mass will carry you below your neutral point. Then, if you apply no force you will be waiting for water to push you up again and gravity to push you down again like a swing in super-slow-motion settling down. So the more gently you ‘sit down’ into the water the less up/down settling there will be. Now, for those with higher body density it may be more difficult to get to this settled point – if there is one. You need to eliminate all momentum of your body sinking due to the initial drop of your body mass into the water – because that momentum will carry you down deeper than your neutral point, and it will take way too long (for holding your breath) for the forces to push your body back up to it. Imagine one of those lift-chairs used to lower disabled or paralyzed swimmers into the water – imagine that chair very slowly lowering your body into the pool until the water takes over and the chair sinks away from under you. That is what you are looking for – the point where water will take over and you won’t sink further unless some force is added to the equation. Sinkers need to realize that density is not the only factor sending your body deeper in the water so easily. You can’t easily change your body density, but you can work on those other factors to remove unnecessary difficulties to your swimming. So determining the facts about your neutral point is a first step in creating a more clear picture of the physics problem you must solve. I would be delighted to hear your results and observations from this self-test for neutral buoyancy point. If you would include some basic body statistics or description that would be insightful too – weight, height, and description of body build (runner, weight-lifter, desk-jockey, etc) and your ‘density type’ – from ‘sink like a rock’ to ‘effortless floater’. 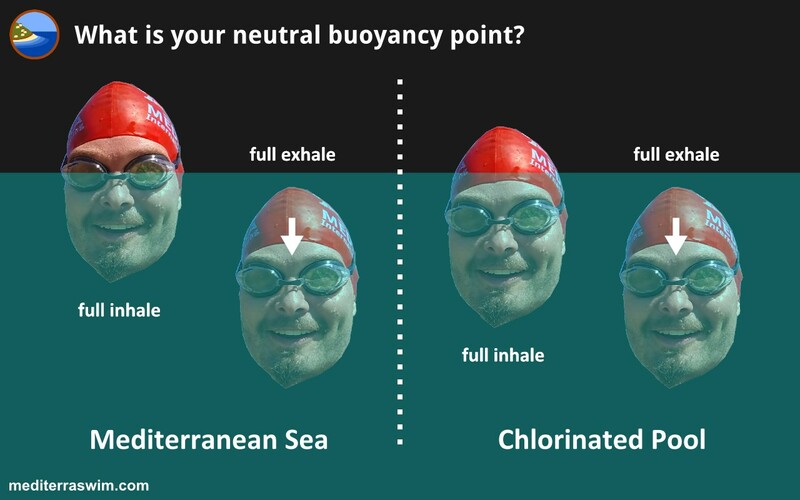 And, if you know how to use some simple photo or graphic editing software you can use these images below to cut/paste your head into the approximate position of your buoyancy point, just like I did with mine. What about us floaters? I can stand absolutely straight as a rod, in the deep end, and my head is fully above water. If I were to drop my TT in the deep end, I would not be able to retrieve it. I’m not sure I could retrieve if I dropped it in the other end! Being a floater is challenging too but I don’t read much about advice for floaters. Hi Helix! Yes, I almost included a note that ‘floaters’ have another set of challenges being too buoyant, but it is rare to hear someone complain about it. Being on the surface makes you vulnerable to all the surface turbulence and waves, which makes stability harder (like how others might feel in the salty sea wearing a wetsuit). But again, most people wouldn’t complain because there is less resistance for forward motion… in calm water. But balance and streamline body position still applies, for a swimmer at any depth. You would also need to consider the width of your stroke, the targets for the lead hand in Skate Position. Being higher than the average neutral line will make stability and ‘traction’ (getting a good grip on the water during the catch) a little more challenging. Do you feel some particular challenges or needs for help in your situation? I am a sinker through and through. I haven’t done that test yet. When I watch other people I see that they are not so deep in the water as me. I struggle to lift any part of me out of the water when swimming. As soon as I wear a wetsuit or a pull bouy I am suddently faster, lighter and happier. I feel that I am dragging a huge weight. I am tall and heavy and a naturally slow person. I am working on my core training and balance to help improve things. But the progress is so slow as to feel I’m actually getting worse! Thanks for all these posts, they’re great to read. Hey Jo! Thank you for sharing your situation. Yes, consider how much easier it is to paddle a canoe or kayak that is floating nicely at the surface and balanced. If one end is deep in the water, or it is filled with water and deep, it doesn’t slide so easily. Have you found a particular idea in any of my posts on sinking helpful? Just curious what may be working for you or not. By any chance do you have a TI Coach within reach to get a look or some video analysis from? Either a live view in a lesson or a video view could reveal some problems and solutions to getting you closer to the surface and parallel to it. It is an interesting physics problem to solve. When you get the body aligned, then working in synchronization it will make things a lot easier. Should your arms be at your sides for NBP? Hey Rich, it may not matter as long as the arms are not creating any lift or pressure or turbulence. But I think it would be easier to remove any risk of interference from the arms if you just hug yourself with the arms. But in vertical position some people might feel their legs drifting behind or forward and want to counter-balance that. Just beware of creating competing forces while waiting for the body to settle between water and gravity. I just discovered abdominal/diaphragmatic breathing, thx to the blog ‘Le plaisir de Nager’, and practicing it increases my buoyancy! TI has never mentionned it! Thanks for pointing that out. I do agree that I have not seen much written in TI materials or discussed online, but several of us do teach it in lessons and workshops as an additional detail in building the body frame. We had an exercise on diaphramatic breathing (in conjunction with bracing the core – to show how both work together) as part of our coach training and our workshop experience last week in Sweden. It is very helpful, though it is a new skill for many humans. But you bring up an interesting point in relation to its affect on buoyancy. Now I want to go do some experiments with different breathing and see its affect on my own buoyancy. Thank you for sharing the insight! – After a dive I am allowed to do some dolphin kick without exhaustion. And finally, while in sweet spot, full abdominal breathing definitely and visibly make me higher in the water! Those sound like great results. I will certainly make a note to experiment on this to see if my experience matches yours. I don’t think most people are aware of their actual breathing ‘technique’ (not even knowing there is technique for breathing!). It makes logical sense to me because when air is pulled down toward the diaphragm it is also bring the center of buoyancy back toward the center of mass more and that should help with balance and a general ease of floating. Even for those who feel that they can breathe easily it would be an important exercise to pay careful attention to how one is breathing so that it can be examined, improved, and protected under more stressful swimming conditions. People who are really great at a skill but are not aware how they do it are still vulnerable to having that skill crumble under unusual conditions – only by studying it and learning to consciously set up or correct a breathing technique can this swimmer protect himself from losing it under a tough situation. Do you ever get enough replies with swimmer buoyancies to collate meaningful results? Hey Tony, I did get maybe 3 more responses and kept the notes. In those few I didn’t see something remarkable to write about so I’ve just held onto it. I should review it and see what may appear to my mind from it now. Perhaps you would give some thought to the differences in technique arising from different buoyancy. For example, one very good swimmer I coach really does swim deeper in the water (in a pool) and needs to be careful not to lift for air, despite rotating generously. Another much younger swimmer in backstroke needs water over her face much of the time to maintain a good body position, when others don’t.